Nuremberg’s public transport operator, Verkehrsaktiengesellschaft Nuremberg (VAG), ordered from Siemens Mobility an additional seven G1 metro trains. The first 2 metro trains are being tested at Siemens’ Test and Validation Center in Wegberg-Wildenrath, Germany. 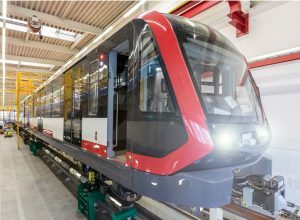 The metro trains will be built in Vienna and the core components of the G1 will be manufactured in the Nuremberg metropolitan area and include such products as the drive converters, traction motors, auxiliary converter units and control equipment. The project management, development and service support will be provided from Erlangen. In 2015, VAG ordered 21 four-car metro trains from Siemens, with two options to deliver up to an additional 13 trains is also part of the contract. In November, VAG ordered six additional G1 four-car metro trains, exercising the first option. With this order, VAG has completed to exercise the option included in the contract signed in 2015. In total, Siemens Mobility will deliver VAG 34 metro trains which will be deployed on Nuremberg’s U1 line. Delivery is scheduled to start in autumn 2019. The new trains will replace 12 type DT2 two-car trains. The U1 line is the oldest of Nuremberg’s three underground lines and is operated conventionally. It is also the longest and the most heavily frequented. It runs from Langwasser Süd via the Exhibition Center, Nuremberg Main Station and Plärrer to Hardhöhe Station, the current most westerly terminus of the line in the nearby city of Fürth. The line has an overall length of 18.5 kilometers and serves 27 stations. Ridership rises sharply when visitors come to major events, such as the Nuremberg Christmas Market and trade fairs. On weekdays, this line is mainly used by commuters.